It's not possible to tell, in my opinion. 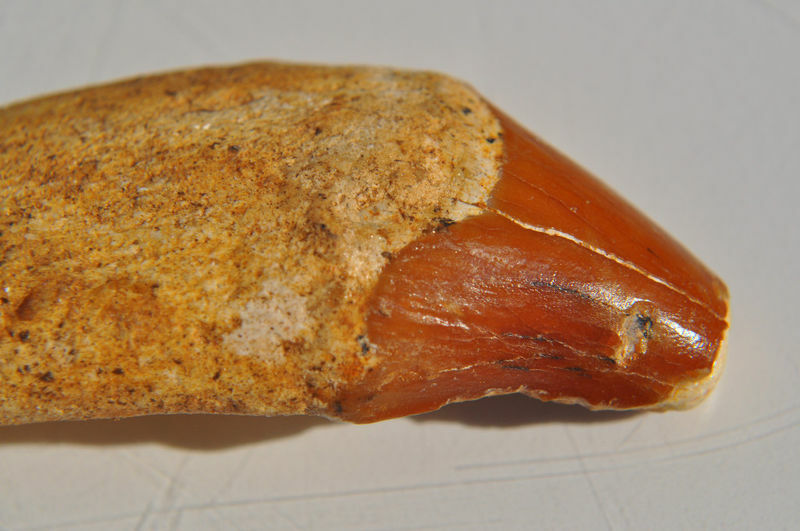 There are a number of late Eocene archaeocetes, and this could just as easily be something smaller like Dorudon. 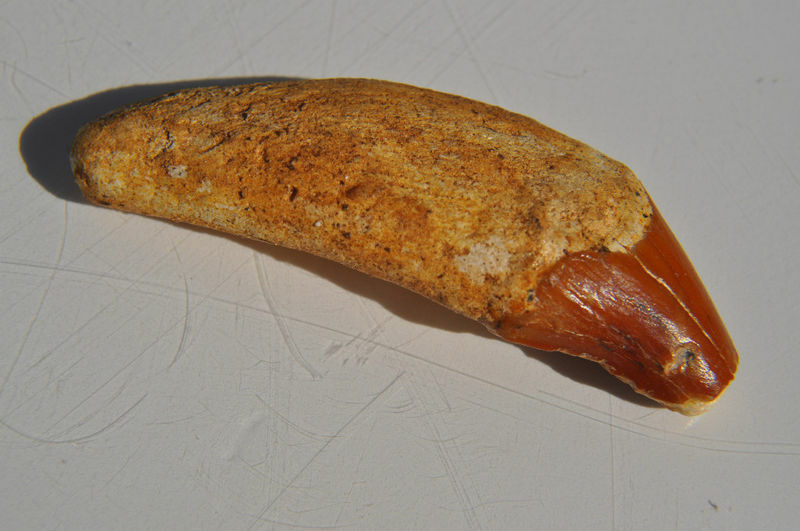 Otherwise, I don't think there's sufficient morphology preserved to even tell whether its a canine or an incisor. How many years have millions due Moroccan finds archeocete? Archaeocete whales are an Eocene phenomenon. I don't know anything about specific Moroccan whales; but Early Eocene (Ypresian) is a reasonable guess. I agree with Bobby, that this could be any of a number of different, smaller whales. Basilosaurus is a monster of the group. The tooth could be a premolar. A couple more things - early Eocene is likely not probable, as only pakicetids and ambulocetids had appeared by the latest Ypresian; the earliest known archaeocetes in the North Atlantic don't show up until the latest Lutetian/earliest Bartonian (~40-42 Ma), and these are all protocetids (Carolinacetus, Eocetus, Natchitochia, Georgiacetus, and some other poorly known critters). As this is much more likely to be a basilosaurid (their remains are more common), it is most likely late Bartonian or Priabonian. Edit: I originally typed this up with North American archaeocetes in mind, and then remembered that the tooth in question is from Morocco. Either way, the fossil record in the eastern North Atlantic is pretty similar to that of the western North Atlantic. 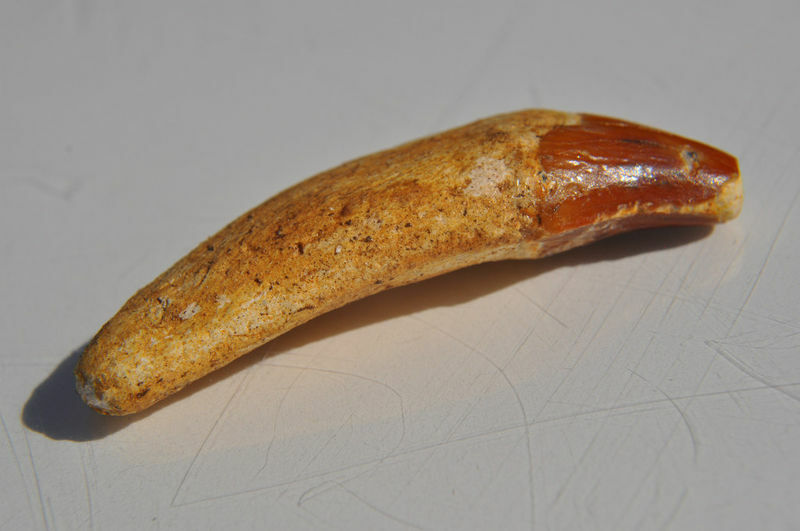 Secondly, the premolars of protocetids and basilosaurids are double rooted (even the p1), making this a canine, or most likely, an incisor. 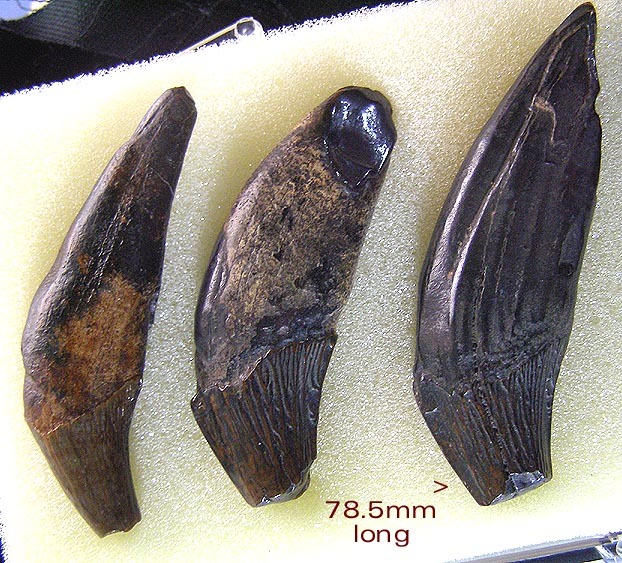 The shark teeth found with the whale teeth include a late-surviving species of Abdounia, Carcharocles sokolowi, along with a rare Xiphodolamia species known elsewhere only from the Late Eocene indicating a Priabonian or late Bartonian age at the earliest as you suggested. If these whales are Late Eocene, they may have an analog here in the SE US -- I mean the basilosaurid Zygorhiza kochii. 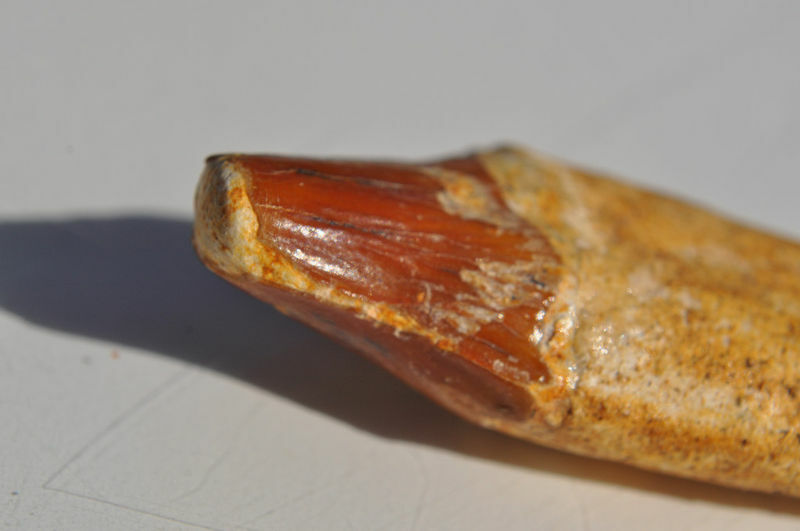 I am surprised to learn that basilosaurids premolars are all double-rooted. Here is a line-drawing so that readers know what we are discussing. 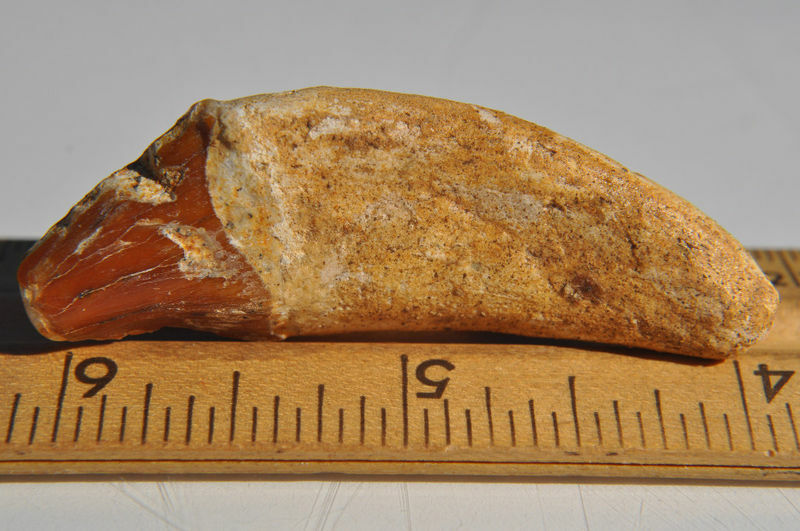 That means that I have no basilosaurid premolars in my collection, only these teeth that I thought were premolars, but may be canines and incisors. Can you believe the odds against finding only canines and incisors! I love it when I am forced to bear down and learn something. Thanks, Bobby. If your collection consists solely of single rooted teeth like those photographed above - then those are all incisors or canines. The first premolar (P1 or p1) is double rooted in basilosaurids (Zygorhiza, Dorudon, Basilosaurus). Otherwise, if you're referring to the big triangular double rooted teeth, then yes, you definitely have molars and premolars - I'm not quite clear how those are differentiated, though (number of cusps perhaps?). Given my future Ph.D. project, I'll have to start looking at basilosaurid and early mysticete dentitions in pretty close detail.